Who controls corporations? I would argue it is still mostly CEOs. Of course, they’re supposed to report to directors but, so far, the balance of power seems to remain with the corner office and the Business Roundtable. A lot has changed since the early 1990s when Sears allocated over $5.5 million to defeat one independent board candidate, Robert A. G. Monks. Most of the S&P 500 now have a majority vote standard for elections… although directors who don’t get a majority of the vote usually only have to offer their resignation to the board. The board doesn’t have to accept it and nothing stops them from replacing tweedle dee with tweedle dum. But, all in all, shareowners have gained relative power in the last few years. CEOs may still control corporations but through organizations such as the Council of Institutional Investors, the International Corporate Governance Network and businesses like the RiskMetrics Group and Glass Lewis, institutional shareowners have gained substantial clout. 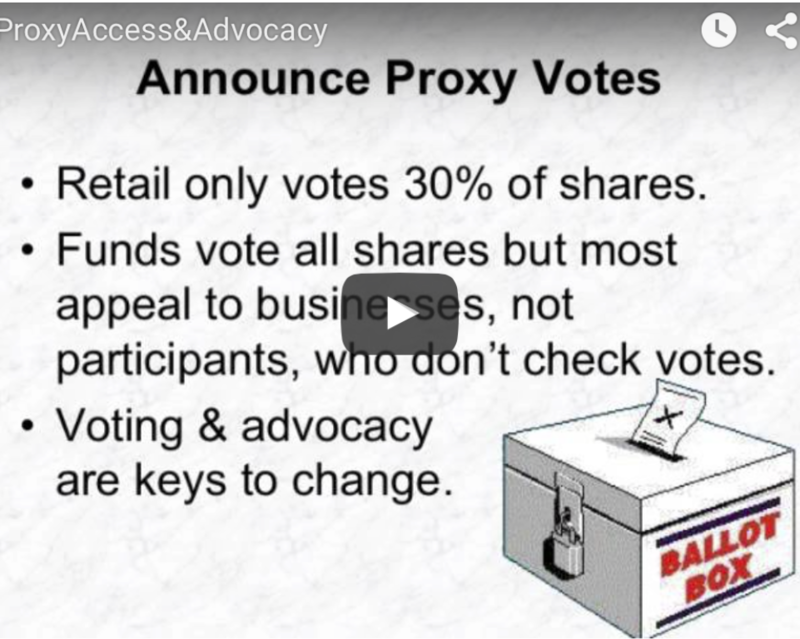 In a few years, ProxyDemocracy.org, MoxyVote.com, Shareowners.org, and the Investor Suffrage Movement might similarly empower retail shareowners and that is where I will probably put most of my efforts. I understand Senator Charles Schumer is already considering a bill that would require shareowner approval of certain political contributions. I trust the Center for Political Accountability will expand their current focus from disclosure to shareowners to permission from shareowners if they can. Our friends at Calvert, Walden Asset Management, Domini, Trillium Asset Management and elsewhere are likely to take up the charge and I will be there lending whatever support I can. 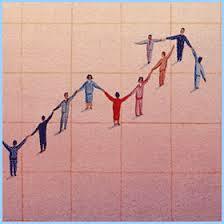 For me, the most important immediate task will remain trying to level the playing field. Investors need to move from holding poker-chip like entitlements to being actual owners. Once investors begin to think like owners, instead of gamblers, they will demand accountability from their corporations. Since most shareowners invest in a market basket of companies, rather than single companies, we should all be able to agree that it is in our best interest if none of our companies makes political contributions. One big start in getting investors to think like owners would be to repeal section 17A, subdivision e, of the Securities Exchange Act of 1934, which requires the Securities and Commission to immobilize securities certificates. As we point out in our draft petition to the SEC, a direct registration system will facilitate shareowner-shareowner communications, reducing the cost of proxy contests and making corporate elections more democratic. Appropriate steps should be taken to ensure communications are presented in a manner that is intelligible to and convenient for average investors. For example, shareowners have long sought integrated proxy solicitations that combine materials from all parties in a contested election. DRS would facilitate this. An increased volume of communications would go hand-in-hand with an increase in the number of contested elections or issues. As average investors realize they were being offered opportunities to make real decisions, retail shareowner participation in corporate elections will likely rise. To further enhance this trend, technology and policies can allow shareowners to customize their participation, opting out of some types of communication, and controlling the form of media and style of presentation of others, much as users customize some news websites to deliver only the types of news that interest them… an RSS feed for shareowners. So, my answer for now is, “let’s get control of corporations.” Institutional investors are already required to vote in order to meet their fiduciary duty. Many are conflicted. Our best hope may be to get individual investors to think like owners. First step is to make them actual owners, instead of holding security entitlements. Take a look at that draft petition, my table on how street name registration results in rights denied, and give us some feedback. You can either do that through the comment function (yes, you have to register with the site first… I don’t want to clean out a lot of spam) or you can e-mail me. 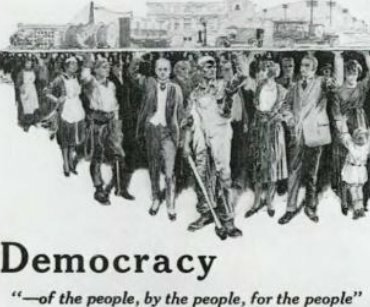 Start using ProxyDemocracy.org for proxy research, MoxyVote.com for voting, join Shareowners.org and the Investor Suffrage Movement. Years down the road, let’s hope Citizens United is overturned. Even then, getting control over corporations, which have so much influence over us, will be vitally important. Financial advisors should also warn their clients that those who those who hold securities under “street name registration” only hold “security entitlements,” not real shares. SEC laws and regulations are written to protect shareholders, not those with security entitlements. 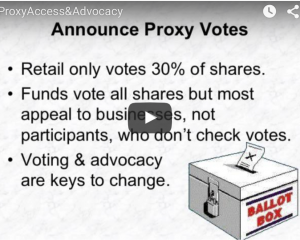 Therefore, Broadridge and others interpret requirements that apply to proxies as not applicable to their “voter information forms.” Counting blank votes for management, with only a microtype warning on the ProxyVote screen and summarizing resolutions so voters can’t even guess the subject are abuses that would end with a system of direct registration and the use of actual proxies. Advisors could further gain the trust of their clients by educating them a little on their role as owners, instead of being completely focused on asset allocation, when to buy, and when to sell. TheCorporateCouncil.net posted a transcript of a recent Webcast on the SEC’s new Proxy Disclosure requirement. Like always, they do an excellent job of sorting out issues for those getting into the weeds. theRacetotheBottom.org has covered a raft of issues lately that are worth a read. These include: Executive Compensation at Goldman Sachs, Executive Compensation, Delaware’s Top Five Worst Shareholder Decisions of 2009 and the need for reinstating Glass-Steagall.